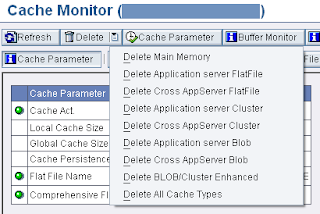 There are several places across BW tools from where clearing of different types of cache can be done. BEx Web Application Designer metadata cache: stores metadata information about objects related to web templates. You can also delete the cache in which metadata information belonging to current opened template within the session to BW backend. To delete this cache choose in BW Web Application Designer: Menu Tools -> Setting -> Delete cache -> Delete cache. Documentation for NW2004 can be found here. This is not valid for BW based on version 7.x. OLAP Cache: so called Query cache is type of cache is used to buffer BW queries data sets to be available for next query run. In this case OLAP processor first checks cache and do not need to read the data out of BW infoproviders. 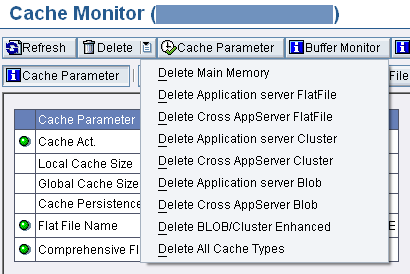 To clear OLAP cache run TA RSRT -> Cache monitor -> Delete or you can go via TA RSRCACHE. Online docu here. If you want to do it from your custom ABAP program you may use function module: RSR_CACHE_CLEAR_ALL_CACHES. HTTP server cache: this is related to HTTP server build in SAP AS server. You can clear it via TA SMICM -> Goto -> HTTP server cache -> Invalidate cache -> Global in system. Online docu here.